"I came to SSA in the mid 1980s to pursue my doctorate and take advantage of the rich history of the University of Chicago, and the proven mission and faculty leadership of the School of Social Service Administration in contemporary social work education and social welfare issues," recalls Earlie Washington. "I was working as an assistant professor at a small liberal arts college in Mississippi — Tougaloo College — and the president insisted that I pursue a doctoral degree, after a favorable evaluation review," says Ms. Washington, who wanted to continue teaching while contributing to the knowledge base of social work education and policy. "I spent seven years at the University of Chicago — five as a doctoral student and two as a visiting assistant professor — and my goals and vision for the future began to change as I moved toward the administration discipline. Jeanne Marsh (Jeanne C. Marsh, Ph.D. and Dean of SSA during Ms. Washington's matriculation) was a role model who gave me my first faculty position at the SSA after I graduated. Then I was recruited to be director of the Undergraduate Social Work Education program at the University of Southern Mississippi at Hattiesburg. In 1994, I became director and associate professor of their School of Social Work, achieving tenure in 1996." 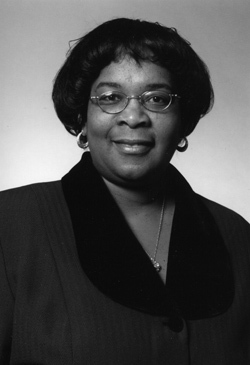 In 2000, Ms. Washington was recruited to become director and professor of the School of Social Work at Western Michigan University in Kalamazoo. In 2006, she was appointed dean of their College of Health and Human Services, where she directs 95 faculty members serving more than 2,000 students in a variety of degree programs in the various schools, and two certificate programs in holistic health care, and substance abuse. "As dean of a multi-disciplinary college, I am realizing and exceeding my goals administratively as I see the positive impact SSA has had on my career. They gave me the tools, provided me with the opportunities and fostered relationships that have made me a more effective teacher, and they prepared me in the administration and organization courses to be a leader in my field," Washington notes. "SSA's Elsie Pinkston (Elsie M. Pinkston, Ph.D.) was my mentor as she encouraged my passion for working with the elderly and engaging in research about family care-giving for older impaired relatives. I met Elsie when I first checked out SSA for my doctoral program, and when I discovered that she was working on a national elderly support research project, I knew I wanted to come to SSA and work with her. We connected immediately and I worked with her as a project director on such programs as a day care center for adults in the inner city that catered to people of color, and I helped train care givers and staff to manage behavior patterns. We were involved with real life issues, not just academics." Ms. Washington's time at SSA is filled with good memories that helped advance her career. She says, "My years at SSA were challenging as every one of my professors put me in a position to accept diverse opportunities that would arise during my career. They also connected me to a network of leaders in the profession. I made lifelong friends there, and have frequent contact with many of my classmates." "One of the proudest moments of my career happened in 1998 when SSA and the University of Chicago recognized my accomplishments with the Elizabeth Butler Alumni Award. This is a definite milestone in my life and my career. My goal is to continue being an effective administrator in social work education and a leader in professional education." Ms. Washington credits her SSA education with preparing her to manage research grants, work with faculty on service projects, and to stay connected to the dynamic nature of social work practice. "With SSA and the University of Chicago, I had the best of two worlds; the large university with its vast resources, and the smaller SSA with its personal dimensions." Ms. Washington says that at times, she becomes frustrated with attending to the minutiae that takes her away from her goal of helping others. "The best part of being a social worker is to make a difference in the life of an individual. As an administrator, I help remove barriers and engage in problem-solving of individuals and groups." Her service roles include: an appointment by the Governor of Michigan to the Michigan Home Based Child Care Council; commissioner on the Commission on Accreditation for the Council on Social Work Education; and the elected Region 6 Representative for the National Association of Social Workers, at the National Committee on Nominations and Leadership Identification. As a result of these significant accomplishments, she received a Woman of Achievement Award from the YWCA of Kalamazoo, Michigan, in 2011. "I feel fortunate to have this growth opportunity that allows me to apply my experience in social work education administration in a broader context. I always benefit from my SSA experience because it keeps giving."